Let’s compare wordpress plugins for forums like WPforo and Asgaros on one hand and standalone internet forum applications like Xenforo and Vbulletin on the other hand. WPforo, Asgaros, and BBpress are wordpress forum plugins. They can benefit from other wordpress plugins for security (e.g. : akismet) or monetization (woocommerce). However, at the end of the day, WordPress was designed to be a blog with steady pages. If you want to have as many features as in Vbulletin/Xenforo on a WordPress forum plugin, you must install many plugins. We found a webmaster who had to install 25 wordpress plugins to get all the features he wanted for his BBpress installation. For example, you must install Akismet, WP stop forum spam to fight spam, woocommerce to monetize posts, OIO ad publisher to manage ads and several other plugins. You must also dive into PHP and CSS to get as much features as in Vbulletin and Xenforo. We also didn’t find any plugins to customize the user permissions of wordpress user roles. Anyways, even if it would exist the number of wordpress forum user permissions are small compared to the number of user permissions from Xenforo and Vbulletin. On the other hand, Xenforo and Vbulletin have been developed to be used as an internet forum platform with user groups, customizable user group permissions, integrated security modules, moderation, website themes and layouts. They are delivered with all the necessary features right from the beginning. 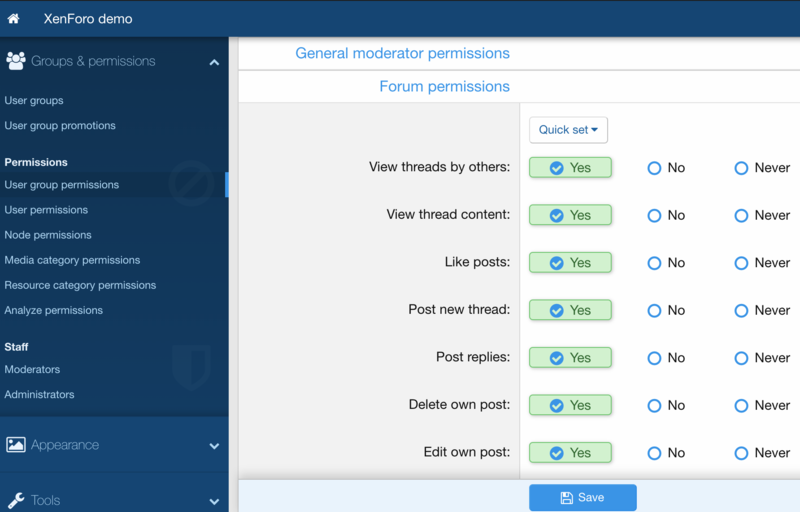 For example, if you want user posts to be approved by the administrator before being displayed on a forum you can set it up. On the other hand, with a wordpress forum plugin, you need a special plugin to manually approve users. We compared the performance of Xenforo/Vbulletin on one hand and the performance of BBpress, WPforo, and Asgaros. We found that the WordPress plugins were slower. It is related to how WordPress is designed. Every time you load a WordPress page, the code of every WordPress plugin is checked. The more plugin you install on your wordpress installation and the slower your forum will be. That’s why forum plugins in WordPress will never equal the performance of opensource or free standalone forum installations (phpBB, Vbulletin, Xenforo). It is very much like when you have a blog. For example, when someone clicks on the like button on an Asgaros page, the page is reloaded. This is very slow compared to the instant +1 of Xenforo. webmasters mention performance issues related to their forum plugin on WordPress. The paid forum platforms like Vbulletin and Xenforo are better because they will sustain the increasing amount of web traffic and pages. Also, Server caching is really simple to implement in XenForo config files. On the other hand, it is more complicated to implement caching on a wordpress installation. All the articles about server-side wordpress caching are vague. On the wordpress installation side, for page caching, we tried the W3TC plugin in the past and it ended up with getting a 500 HTTP code without us knowing it. Pages used to be displayed but it returned a 500 HTTP error code. We also faced compatibility issues between W3TC and other installed wordpress plugins. I also suspect the cache plugins to do unnecessary daily routines like regenerating all pages every hour or every day. There are closed threads that never change however the wordpress cache plugin will regenerate its HTML pages. We think we know what webmasters do when they have a high traffic WordPress powered forum. They subscribe to a CDN (Content Delivery Network) and it is far from being free. They may also rent a pricey dedicated web server. Since WordPress plugins are installed on top of the WordPress installation, it means that the webmaster has to follow-up on the plugin updates. On the other hand, when you install XenForo or Vbulletin. There is only one update, the software update. An update of Xenforo or Vbulletin is safe. On the other hand, after a wordpress plugin update, you never know what could happen. That’s why it would be advised to install a development version of your BBpress, Wpforo or Asgaros forum, to update the plugins and see if everything still works. This also means that the webmaster has to follow-up the outcome of every wordpress plugin updates (woocommerce, cache plugin, shortcode plugin, payment method plugin…). Meanwhile, you don’t need to have an additional Xenforo or Vbulletin forum. Since all features of Xenforo and Vbulletin are integrated, there is no risk of facing problems related to an update. If we compare the wordpress forum plugins and the standalone solutions out of the box, standalone forums have many more features. On top of that, an issue on wordpress based forums could arise when the number of threads and users increase. The standalone solutions (Xenforo, Vbulletin, Wotlab) are more likely to sustain the load. Also, I know for sure that the workload related to the maintenance of a wordpress forum will be higher than the maintenance of a standalone forum like Xenforo or Vbulletin since you must update plugins.